Camp starts in just two days! We had our first meeting with the kids going to camp yesterday. Boring meeting, mostly we were just trying to make sure paperwork was turned in and in good order. Those of you who are YOU sponsors will be very familiar with this one. One difference is the names. Many of the names are similar to names we have in the US, but there are a fair amount of !Xhosa speakers and their names are very different, lots of syllables and consonants smushed together in unfamiliar ways that my tongue stumbles over and my brain struggles to get right. I guess wrong on gender when looking at the name at least 75% of the time, far more than the laws of probability would suggest. How am I ever going to remember these names? And I know that most kids have nicknames, so even if I sit all day with this list and memorize the names, I won’t be able to pronounce them correctly and the teen probably won’t be using their real name anyway. Just another way I get to stay humble. I’m thinking of Robin today, who told us in jest one time that her Indian name is “loves your face, forgot your name.” Wondering if I can borrow that one. Today’s meeting with the kids was a bit more fun. We did a few joy songs and talked a bit about the packing list, reminding the teens what to bring. Another familiar task from YOU rallies. We got to meet with our family group leaders and go over the family group material with them for the first time today. I’m excited about these teens, I think they’ll do very well with the material. This weekend is a very special event. Not only is our camp being held this weekend, but also the South/Central region of YOU in the States is holding a rally at the same time. The teens who created the South/Central rally have generously allowed us to use the material that they wrote for the rally as material for camp. So there will be teens on both sides of the world, in both hemispheres, doing similar activities and learning similar things on the same weekend. We’re also planning a link-up over the web. So very exciting! Lots of coordination went into this, and we’re hoping for good enough cell signal to be able to do our live skype on Saturday. Send prayers for good clear cell phone signals. Heading to bed now, another big day of planning ahead. Blessings! Monday was Youth Day here in South Africa. At first, I just thought it was sort of a “yay, youth!” kind of day, celebrating youth the same way we celebrated fathers just the day before. Then I realized that it is a commemoration of the Soweto schoolchildren’s riots which took place in 1976. Oh. You can read about the events here. People said there was going to be a parade at 9 am, so we made plans to be there. It was a misty morning when we left, but the clouds started burning off and it turned into a fine day. When we went where the parade was said to be starting, nothing was happening there, but we met a woman who took us to the rugby field that also serves as a fair ground. People were gathering there, in the stands. There were military vehicles, a tank and an armored personnel carrier, and police vehicles ringing the rugby field, and in the center of the rugby field there was a large tent, and several rows of chairs facing the tent. It was a confusing couple of hours, as we watched the tent and corresponding chairs get moved into new positions not less than three times, and the tent that was there (sponsored by the local funeral parlor) was abandoned for a larger, sturdier military canvas open-walled tent. The crowd kept growing. We walked around the perimeter of the field, to see the displays that the military and other entities like the agriculture department had set up. There were tables with giveaway pens and applications for bursaries (scholarships). There were recruiting stations for the South African Defense Force, and many impressively uniformed young men and women were in attendance. There were displays of rocket launchers and rifles and other weapons that people were free to pick up and aim at their laughing friends, all mugging for the camera. At one point, the military and police vehicles left the field, turning on sirens and going around the town. We assumed that was to drum up interest in coming to the event. Maybe the crowd wasn’t big enough. Soon, a helicopter was seen in the sky, and red smoke started rising from a nearby field. It was alarming-looking, but I was told it was for the helicopter pilot to see the direction and speed of the wind at ground level. The people rushed out of the stands to watch the helicopter land, and some dignitaries were rushed to a waiting car. 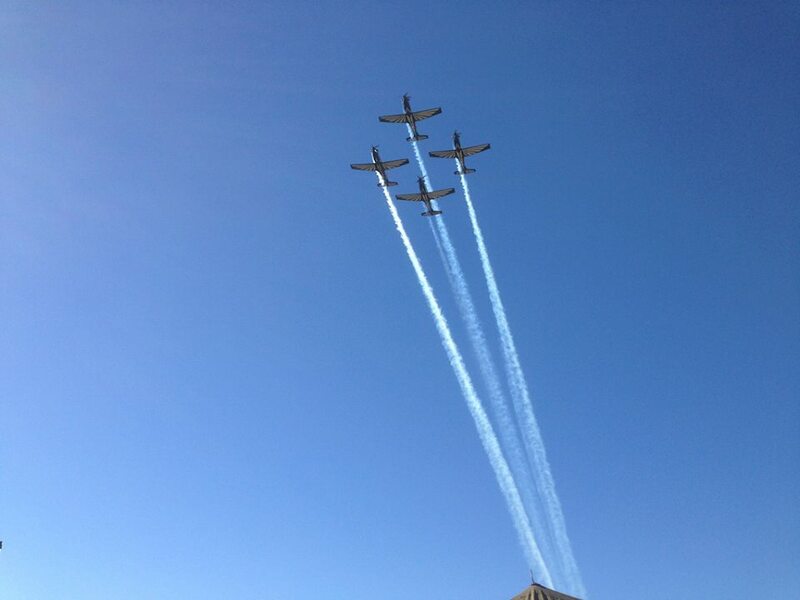 Then, overhead, four fast military show planes began a thrilling series of airshow tricks–formation flying, barrel rolls, the whole bit, complete with smoke trails. It was the South African version of the Blue Angels, and every bit as impressive. Now remember, this is a small town of about 5,500 that is surrounded by miles and miles of farmland. This isn’t some big place where you’d expect to see an airshow. Soon, we were asked to take our seats, and the crowd was encouraged to move into the seats on the field, in front of the tent which had reached its final position. Then, we listened to speeches by several local dignitaries, as well as the Minister of Defense and Military Veterans, Ms. Nosiviwe Noluthando Mapisa-Nqakula. Members of the ANC (African National Congress, the ruling party) were in attendance, veterans in uniform…this was a Big Deal. Then, there was a police dog demonstration. The crowd was encouraged to form a huge ring around where the dogs were already. Some of the children were asked to sit in two long rows for the first demonstration, which was testing the powers of a dog trained to sniff out items. The trainer dragged the prize along the ground to create a scent trail and hid the item and the dog was released and was able to find it. The next part of the demonstration featured four large German Shepherds, on leashes, on one end of the ring enclosed by people. Lots of children, the same ones that had been on the field for the first demonstration, sat along the edges of the ring to get a good view of the next proceedings. The German Shepherds were approached by men, called agitators, who did exactly that. They approached the dogs aggressively, shouting and waving sticks. The dogs, understandably, responded by lunging at the agitators and barking. After several minutes of this, it was announced that the demonstration would begin. The agitator made one final leap toward the snarling dog, then ran across the field and turned. The dog was released and went running as fast as it could toward the agitator, who had a padded arm cover, where the dog attacked. And often, would not let go. Even when the trainer had both arms around the dog, was yelling at the dog, and pulling on it’s collar. The dogs would hang on, until at last, unwillingly, they were coaxed to let go. This went on repeatedly, over and over. Then, rottweilers were brought out and the padding changed to full-body padding, and the rottweilers, when released, would bring down the padded man and bite furiously at the padding until they could be coaxed back to the leash and the trainer. Several times during this display, a person on the microphone reminded the crowd to stay still while the dogs were off the leash. This gave me nightmare visions of one of those dogs, who did not appear to be fully under the control of the trainers, veering off course and mauling one of the children sitting at the edge of the crowd, instead of the intended target, the man in the padding. It made me sick and I needed to get out of there. I know there’s a lot that went on that day that I don’t understand. Given the significance of the day, the strong presence of the military and police, and especially the police dogs, which have been used against people of color both here and in my own country, made me uneasy and feeling vaguely threatened. 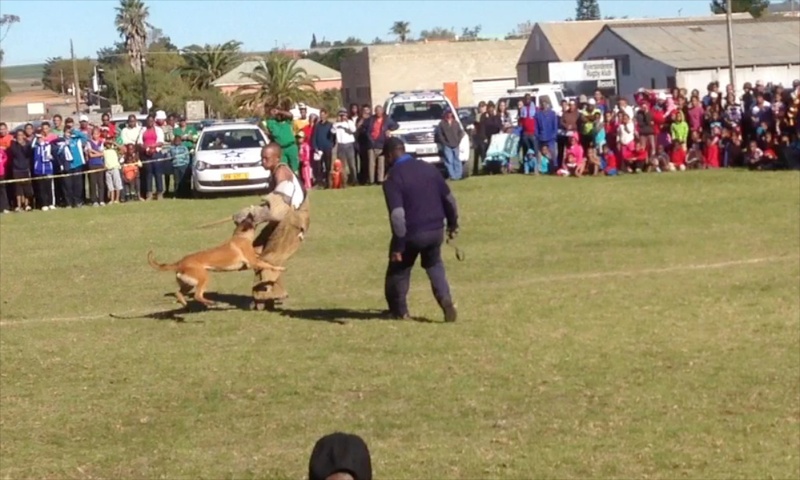 I don’t know what the message intended to be sent by the police dog demonstrations was, but I know it made me scared and sick. But that may just be me. No one else spoke about it in this way. The teens took video of the police dog demonstrations and were re-watching them in the living room when I went to bed that night. They were hooting and laughing. Maybe they didn’t see the same menace I did. I really hope not. My sleep was uneasy and full of dreams. Still processing. Happy Father’s Day to my Dad. We miss you and Mom and will see you guys again soon. Hope you’re reading this blog. Thanks for supporting us in what we’re doing. You are loved, loved, loved. We found out a couple of days ago that the southermost tip of the continent of Africa was about 100 km from Riviersonderend, so today we set out to see it. When you’re halfway across the world from your normal stomping grounds, you’ve just got to go those extra miles (or kilometers) to see the touristy stuff. It was beautiful. Not nearly as dramatic as the designation would apply, but beautiful all the same. Turquoise water hazing to azure blue at the absolutely flat horizon. Nothing between here and Antartica except a lot of water (and, I think, one tiny island a long way from anywhere). 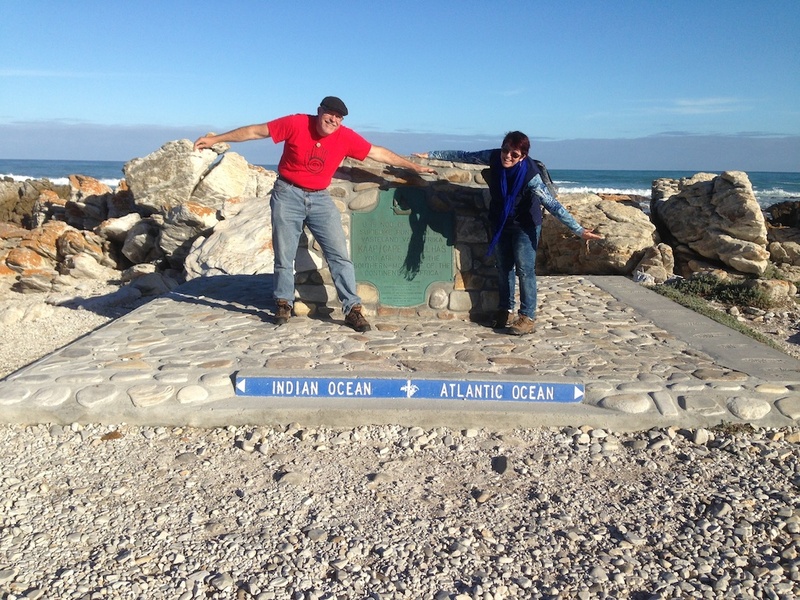 Where we’re standing is the dividing line between the Atlantic and the Indian Oceans. But sit for a while on the rocks facing the shore and you quickly notice–there is no line. No delineation of color, temperature, or any other observable feature that places this particular line anywhere. It is all one body of water, as far as the water is concerned. No separation. It seems trite to draw the metaphor of the oneness of humanity, but that’s exactly what I’m going to do. I’ve come halfway across the world, only to meet myself. I see myself everywhere. In the kids, glad to be done with exams, and excited for camp. In the women and men doing their best to raise their family and make a life for themselves. In the rowdy and drunken men watching rugby and escaping from whatever they’re escaping from for a while. In the man who told me he’d love to come to America, that he believed one day he’d come to America, and in the next breath said he believed he’d die before he’d ever get there. Like Narcissus, I’ve come to gaze in the pool and see only my reflection everywhere. It’s another manifestation of the saying, “wherever you go, there you are.” I always took that as a tautological statement. Of course, wherever you go, there you are. Yogi Berra could tell you that. But I think it means even more than that now. It means that you can travel the world, meet all kinds of people, and if you see the humanity in them, and recognize the humanity in yourself, you will see that we’re all the same. We are all one. One. This past week I’ve been listening to Calvin, who’s in first grade, practicing his reading. He’s reading simple stories like this. Do you remember this story from your childhood? 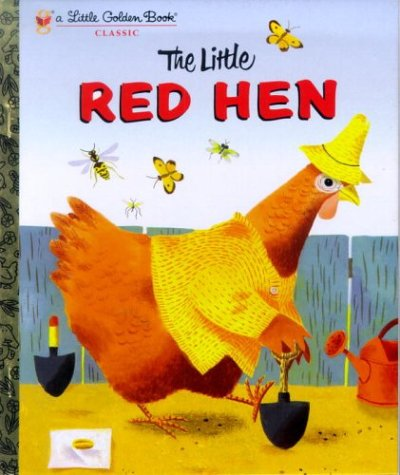 Once upon a time, there was a little red hen. She found some seeds of wheat. She wanted to plant the wheat. “Who will help me plant the wheat?” she asked. “Not I” said the dog. “Not I” said the cat. So, the little red hen planted the wheat herself. The wheat began to grow, and soon it was time to harvest the wheat. “Who will help me harvest the wheat?” she asked. “I will!” said the dog. “I will!” said the cat. “I will!” said the pig. But the little red hen said to them, “You would not help me plant the wheat. You would not help me harvest the wheat. You would not help me grind the wheat. You cannot eat any of the bread.” And she ate all the bread herself. Why am I telling this story? This story is a morality tale, isn’t it? You don’t work, you don’t eat. It’s the touchstone for almost everything in our culture: how we view work, how we view success, how we view charity, how we view poverty. A lack of willingness to work is one of the great sins. It affects my ability to receive. I have a great deal of trouble receiving. I am a giver. It’s how I justify my presence on the planet (yes, I have uttered this phrase, too many times. I’m learning. Slowly, but learning). I am much more comfortable giving than receiving. And now I am the guest of people who live on much less than I do back in the states. And my urge to give goes into overdrive. I think nothing of spending 60 rand for lunch, it’s only six dollars, less than I would spend for lunch at a restaurant in Austin. 60 rand goes a lot further in our hosts’ house. I would like to give money to them to pay for the meals they are feeding us, but they don’t want that. They want to give. I must receive. It’s hard!!!!!! Everything in me says that in all fairness, I should be the giver here. I have more. Those with more give to those with less. That’s the rule, says my moral system. But my hosts want to give of what they have. I dishonor their offering if I try to pay for it. I can’t do that to such loving, good people. So, the little red hen speaks up. You must work! Offer to do the dishes. Help set the table. It’s another desperate effort to be the giver, not the receiver. This ethos dies hard. But my hosts don’t really want that either. They want us to sit and enjoy the food, enjoy the company. I do offer to help, but my offers are turned down. The little red hen is not welcome here. So humbly, I am learning again. I feel like I am always making mistakes. Hopefully my love shines through and my gracious hosts forgive my mistakes. I am humbled, I am cared for, and I am blessed.